We’d love your help. 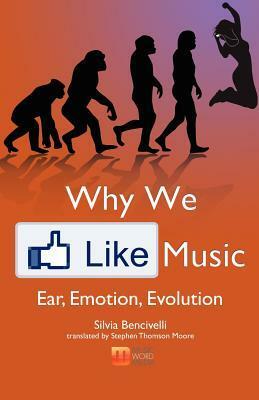 Let us know what’s wrong with this preview of Why We Like Music by Silvia Bencivelli. To ask other readers questions about Why We Like Music, please sign up. Not sure. I agree that music has a profound impact on our emotions in particular, a point made clear to me watching Groundhog Day the musical - it was much more moving than the movie ever was, which surprised me. But I'm not sure I'm much closer to why after reading this book, although it's not the authors fault. Why we like music succinctly describes the status of music from a scientific perspective. The initial chapters tackle music history, going back into prehistory as well, to examine when m Not sure. I agree that music has a profound impact on our emotions in particular, a point made clear to me watching Groundhog Day the musical - it was much more moving than the movie ever was, which surprised me. But I'm not sure I'm much closer to why after reading this book, although it's not the authors fault. Why we like music succinctly describes the status of music from a scientific perspective. The initial chapters tackle music history, going back into prehistory as well, to examine when music emerged in humans. This, in addition to early attempts at music science (e.g. Pythagoras) was a fascinating read. Part of the reason for this was the clarity of our current knowledge - the rest of the book doesn't achieve this, and for good reason - the state of knowledge about music science is still limited and subject to much uncertainty.